In a previous article I described how to determine the value of an email name, beginning with using email for Regular Promotions, Last Minute Items, Low Cost Promotions and Newsletters. 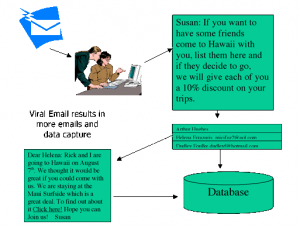 In this article I will complete the analysis adding other uses for email names. Every database marketer likes to think up retention messages. What are they? Birthday cards, anniversary cards, season’s greetings, thank you messages, customer surveys, service reminders, quarterly savings summaries, etc. The value of these messages is not in the response, since none is requested or expected. The value is due to the fact that they keep customers from defecting by building profitable relationships with them. The profit comes from the increased retention rate and the consequent increased lifetime value. To understand this, let’s set up a control group that does not get the retention messages. We will determine the lifetime value of this group. This represents customers of a women’s dress chain that has several stores. It costs them $170 to acquire women who make two visits to the store per year, spending an average of $160 per visit. The store retains only 40% of these women into the second year. Of those left, 50% remain to the third year. The number of visits and spending per visit tend to grow among the loyalists still shopping at the store. The store spends $4.00 per year on direct mail marketing messages including seasonal specials. They lose money on women acquired in the first year, but overall earn a good profit from those who remain so that the lifetime value of a newly acquired customer after three years is $111. The store is doing well. As you can see, these retention messages have a dramatic effect on the women’s behavior. Note that we could not have had this effect by simply increasing the direct mail which was costing us about $0.50 per message. Had we tried that, 36 messages per year would have cost us $18 per customer of $3.6 million per year, which would have seriously eaten into profits. In addition, many of these email messages were quite timely, and could not have been sent at all by direct mail. The gain to the store is $12 million pure profit in the third year. Now we can compare retention messages by email and direct mail. As you can see, increases in retention and lifetime value are much more difficult to measure than other direct marketing factors. You have to have control groups that do not get the retention messages and see, after a period of time, whether there is a difference in the retention rate and the lifetime value. The only differences between email and direct mail here is that direct mail is probably more effective in building retention than email. A thank you letter printed and mailed means more than a thank you email. The same might be true of birthday cards and other retention messages. But on the face of it, however, it is a lot easier to get management to spring for $8,000 for email birthday cards than for $100,000 for direct mail ones. The probability is that the emails will be much more widely used as people see the value in them. So the email will probably be the clear winner in retention messages. Here is an area where email wins in a walk. When people order something, you follow up with an email confirmation (or a mailed confirmation). When the product is about to be shipped, you email the notice with the tracking number (it is too late to do this by mail). When the product arrives, you send an email survey: did it arrive OK, and was it to your liking? Here, again, the email wins. The value is measured in customer retention and increased lifetime value. You may be able to send only four direct mail follow up messages per year, but you can send 12 emails or more depending on transactions. The effect on retention and LTV from each message would be the same to the customer. Because of the cost of follow up messages by direct mail, very few companies send such messages. A better comparison than email vs direct mail for follow up messages would be to test email versus no follow up at all. The boost in retention can be measured over a period of a year, and can be quite substantial. This is an interesting concept that only works in certain product situations. You can get some customers so excited about some product that they will write to their friends about it. What kinds of situations work for viral marketing? As you can see, the list is long. How does viral marketing work? You send an email to customers inviting them to invite other customers by entering their names on a micro-site. This site, connected to your database, records the names and suggests messages to be sent to the names. When the customer clicks OK, the messages are sent and if they click here they see a micro-site inviting them to accept the offer thus helping the customer and themselves. One email, here, results in the capture of more names and ultimately thousands of other emails all promoting your product. Viral marketing is unique to email marketing. It cannot effectively be done by direct mail or phone. Viral marketing can be used for very inexpensive items or for expensive ones. The cost per sale of $16.67 shown here is assuming that the viral messages sent by customers to their friends will have a higher response rate than messages sent to prospects or to customers in general. Viral marketing can be very powerful if artfully used. Of course, not every company can use every one of these marketing methods, but your company can certainly use at least half of them. I have not included the rental value of emails which, in some cases, can be substantial. We can say with some confidence that email names, with permission, are worth at least $10 each to any company. To my knowledge, few companies have sat down and done this analysis and know, with any kind of precision, what emails are worth to them. What does that number dictate to you in terms of marketing strategy? You must collect emails and get permission to use them. Telemarketers must be compensated for capturing these names. Every form should be revised to include a space for the emails. Don’t wait for the forms to run out. Junk them and print new ones. Run contests in which to enter you go on the web to a micro-site and enter your email with permission to use it. Be creative. You gain $10 per year for every email captured. Lenscrafters gives $10 for each email name provided by customers.